be.knit.picky. : Hunter's Vest & Giveaway!! We are officially in the home stretch. Baby K is set to arrive within the next 5 weeks and preparations are in full force. I have been knitting up a storm. Seriously, this baby will have a hand knitted item to wear every single day of the week and then some. My 4 year old is even getting in on the knitting fun. Which, is where my latest design idea actually stems from. Hunter aka 'The Little Dude' suggested that I make a vest for his soon to be baby brother or sister (eeeek, the anticipation of not knowing whether we are having a boy or girl is at it's peak right now!). He even picked out the yarn from my stash for said vest. What can I say, the kid has great taste - he went straight for the Malabrigo Merino Worsted. So today, I present to you, Hunter's Vest. 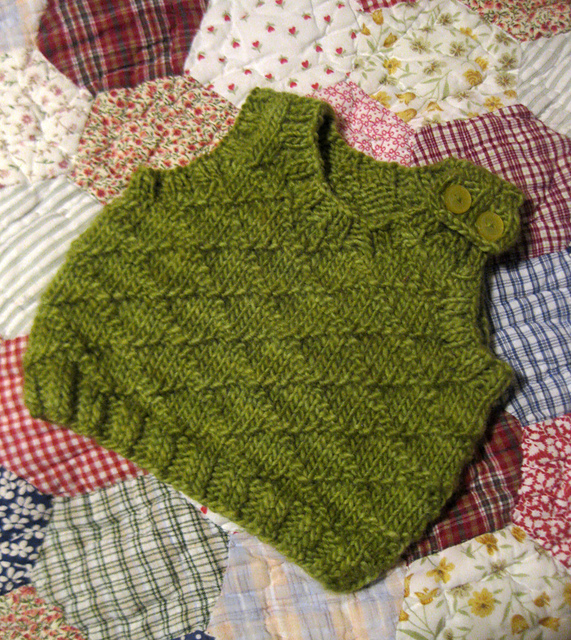 The vest is knit in the round from the bottom up and the two smallest sizes (0-3months and 6-9months) include a button closure. If you have ever wrangled an infant/baby you know this is a must have feature! I love the texture that this stitch pattern gives to the garment. Not too busy, yet busy enough to give the vest that extra design element. Plus, it is really easy to follow and you will memorize it quickly. I actually knit the sample (0-3 month size) in one day. Since it is a gender neutral pattern, this would make an excellent baby gift! In honor of my new pattern, I will be giving away one skein of Malabrigo Merino Worsted in Burgundy, Frost Gray OR Shocking Pink as well as a copy of the pattern. One skein is enough to make the 0-3 month or 6-9 month size. I'll even throw in some matching buttons! Please comment on this post with your color choice (and don't forget email!) before Wednesday, February 2nd at 8pm. The winner will be chosen via random number generator. I put it on my blog! Love your stuff Brenna!! Super Cute! I'd love to make one for each of my boys! I love Burgandy! Gray (since I don't know what we are having yet)!!! Adorable! Gotta have that Shocking Pink! Looks like a great pattern...I would love to make the burgundy! ooh me! Frost grey. Lovely pattern. oh my goodness that is adorable!!!! :)thanks for the chance to win! Love the vest; Frost Gray would be the best for my little guy! Adorable! I'd love to knit this when we have another child. Little man is too big already. We would want it in frost gray. I love the gray, but I would also love to see my niece in the pink. Very cute! 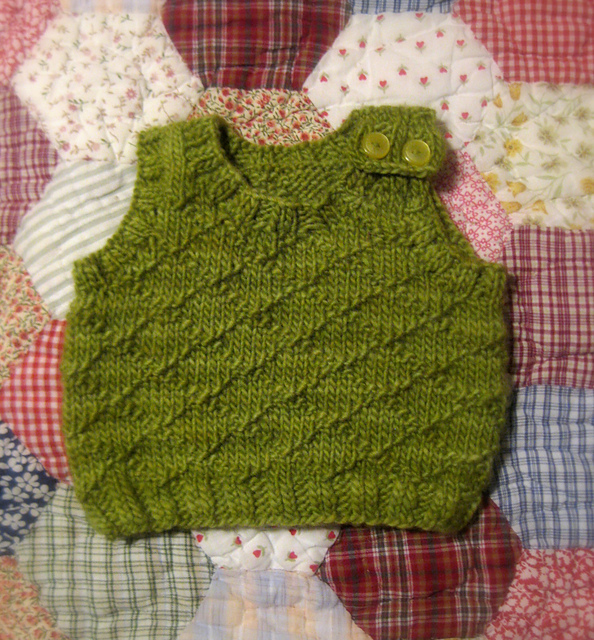 I saw it yesterday when I was looking for vest pattern for my little man. I think Frost Grey would be my top choice for colorway. Gotta love Malabrigo! Cute vest! I like the frost grey. Super cute vest pattern! I love it! Very cool! The world needs more baby vests. Frosty is fun. Love this pattern! I would have to choose frost grey so that both my son and daughter could wear it (twins!). Thank you! Love the vest. Since I have grandbaby #4 due to arrive the first of July, the gray would work well for either. My son doesn't like patterns or anything with duckies on it & loves gray, so if he has a daughter, he'll have to make do with a pink something - flower - ribbon - ??? on the gray vest. But do you know what? I'd be happy with any color. Grandkids don't get ALL my handknits! what a great vest! I like the frost gray the best. good luck w/ your new little one! I LOVE it!! Our daughter could totally ROCK that AWESOME vest!! She'd be 6-9mo size and we'd love, Love, LOVE gray!!! Love the pattern! Very stylish! How much yarn I will need for size 2y? Love the grey! How adorable!! I love the stitch pattern. I would love to make this for my 6 month old. Thanks for offering a giveaway. I'd be making it for my granddaughter, but it's cute for a girl, too. Thanks for the chance to win. (although I do like all the color choices)! I found you via ravelry. Off to check out the rest of your blog. How precious! I have a little cousin named Hunter so the pattern reminds me of him :) Frost gray is so pretty! Beautiful vest! I'm due in July and would love to make this for my LO! Lovely pattern, and good luck and strength for the birth! I'd love the grey yarn. Lovely pattern! Would adore knitting this for my new grandson in the grey yarn. Lovely yarn. Would adore knitting the vest for my new grandson in the grey yarn. Saw this linked over on Rav. That's such a sweet little vest! I would love to make it in grey for my baby boy. Thanks for the contest! And congrats on your soon-to-come baby! The grey would look fantastic on my son for Easter. Lovely pattern. If I win, I'd love burgundy. Oooh! Would be lovely in grey! What an adorable pattern! I think the burgundy would be nice for my grandson. My new nephew would look adorable in this...in gray please!! thanks!!! Ooooh, I'd love to get my hands on this stuff! How about the gray!? Thank you! Super adorable pattern! I would like Shocking Pink if I win. That's a very cute vest! gray please. Me. Me. Me. Please. Please. Please. I'm making the photo shoot prop right now! !